I have been working in the industry for about 20 years. I started off working as a bartender, then as the UK’s first Rum brand ambassador and then as the World’s first global rum ambassador. 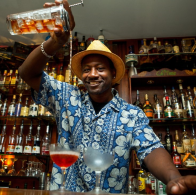 Creating the UK Rum Fest, the world’s first international Rum festival in London back in 2007. Before then, there were no rum events that attracted brands, aficionados, blenders and distillers to educate rum lovers through tastings, masterclasses and seminars. This October we will be hosting our 11th annual event. I can’t remember my first rum as I was four days old, but I’m told by mum that it was a 63% ABV Wray & Nephew Overproof rum. My mum is from Jamaica! To me it’s more than a spirit, it’s a way of life! Five year's wiser than I am today. I can’t remember as it was a very good night. But it was probably aged for several years and drunk neat. Rum and chocolate is a great combination, but I especially love rum and cold dry meats such as chorizo, ham, smoked beef and salami. It’s hard to nail it down to one, but depending on my mood it would be either a Daiquiri, Rum Manhattan or Rum Old Fashioned. True unadulterated premium rums. Especially from independent bottlers. The one in my glass, the next one or a FREE one! Many thanks to Ian Burrell. Who will be our next Rum Insider? Click back soon to find out!